In case you were wondering, we decided that it would be a great idea to share our ARCs with our followers by sending them on a tour. If you've missed the original post, here it is - Good Choice Reading ARC Tours. We do not know if this will be a permanent thing on Good Choice Reading or not, but testing it out doesn't hurt. If you'd like to sign up for our tours, please visit our ARC TOURS page for rules and sign up form. 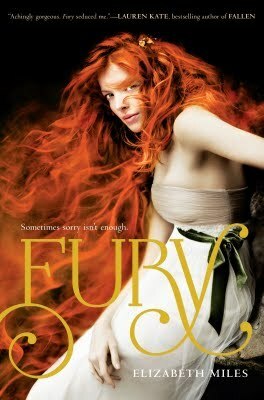 Our first tour will be Fury by Elizabeth Miles. Maria was kind enough to donate her copy for this tour, so please we ask that you take very good care of it. Treat it as if it were GOLD lol. If you would like part of this tour leave a comment with your name and state below. Don't forget to visit the ARC Tours page for rules and sign up form if you haven't already. Each tour needs a limit of FOUR people, max being SIX. First FOUR will have an automatic spot on tour, final two will be chosen by Random.org. If I get accepted on the tour, could you email me with the address I put on the form? I'm moving in a few days and I might of accidentally put my current address instead of my new one on the form. Thanks! I would love to be a part of this tour as well! Please don't forget to read the rules and fill out the form. Thank you! I would loveto be a part of this tour! Thanks!